Elaine and Andy Nobbs with Bob Holman at The Food Gallery Deli. The expansion of a Marlborough business has seen the return of a delicatessen to High Street and the opening of a large new coffee shop. Last week the coffee and sandwich shop trading as The Food Gallery moved into larger premises vacated by King’s Licensed Café at 47-48 High Street. And on Thursday, The Food Gallery Deli opened in the former coffee shop at 42 High Street, marking the return of a delicatessen to premises occupied by the renowned Mackintosh of Marlborough deli for many years. The man behind the brand is Bob Holman. He opened The Food Gallery with wife Nikki in 2006, and built his custom base by selling sandwiches door-to-door around Marlborough’s business community from his vintage bike and kept them by serving what many consider to be the town’s best coffee, cakes and sandwiches in a relaxed atmosphere. 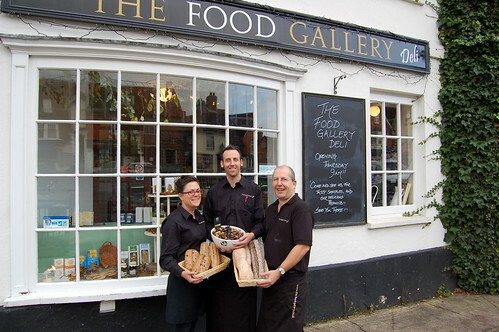 The move to the double-fronted shop has led to the creation of two new part-time jobs, with possibly more to come as The Food Gallery develops its business further, by selling and serving wine and offering food made at the delicatessen. Before opening The Food Gallery Deli, Andy managed a farm shop near Bath, while the couple supplied outside catering services to The Food Gallery for three years. And opening a new business at 42 High Street is like coming home for Elaine, who was the chef at Mackintosh of Marlborough. The shop sources and sells the very best local, regional and international produce. There is a large selection of cheeses, free range ham cured in Bromham, and Italy’s best pasta, imported specially. Elaine makes terrines, tarts and patés in the deli’s kitchen, and speciality bread – including rye and sourdough – are freshly baked on the premises. Crellow chutney is made to order by a husband and wife team in Cornwall using seasonal vegetables. Guilberts chocolates are hand-made in Bristol by the city’s oldest chocolate makers. And Al-Maida olive oil comes from Jordan, via Cirencester. Andy said: “Our customers can expect excellent food and knowledgeable service. We both have a passion for food, and the opportunity to open our own deli is a dream come true for us.